Between learning more about Halo: Reach and still playing Firefight mode with our friends in Halo 3: ODST, we've got a bit of Halo on the brain. GameInformer.com is in the same boat, and have taken a look back on the development of ODST after the fact to supplement their desire for Halo. We take a look at the inclusion of Firefight mode and the history with the team behind the magic of ODST from the GI interview of ODST creative director Joseph Staten. "We figured it would take about a week for a movie of all the audio logs to appear on YouTube (and we were right) for folks who didn’t want to scour the city. But for folks who did, we wanted to make it a decent challenge. Some audio logs were definitely harder to find than others, and early on we considered adding all their locations to the map as we unlocked them. But we found through playtesting that people thought this wasn’t fun because it was too easy. So, again, we did our best to land somewhere in the middle, and we’re really happy players enjoyed Sadie’s story." With the night vision, a lot of players (myself included) got lost, or had trouble making out landmarks, items, or enemies even with their VISR's on. Staten was asked about this design choice as well, giving his opinion on what the "issue" may have been with the night time portion of the game. "I don’t think the VISR was as much an issue as the geometry of the city itself. And if we’d had more time or a bigger team, of course, we would have loved to create more unique geometry – more landmarks to help people orient themselves and find their way. But the small group of guys tasked with constructing the nighttime city (the biggest Halo environment we’ve ever made) did an amazing job with the time they had. It was a staggering amount of work, and they spilled a lot of blood tweaking the VISR and the city lighting to try and strike a balance between mood and playability." "We’re glad folks love it because we do, too! Firefight was actually a feature we planned for Halo 3, but just didn’t have time to ship. 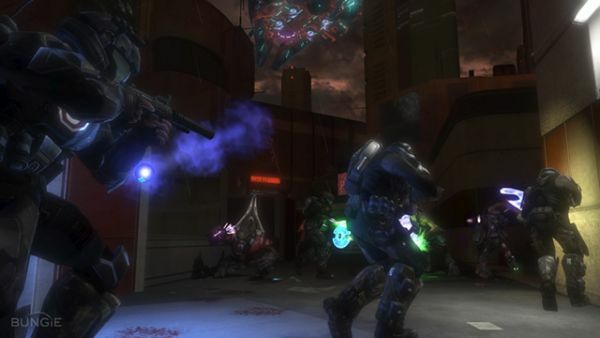 It was a high priority for ODST from the get-go, but our marketing wizards advised us to keep it under wraps until E3 where people would get a chance to play it themselves and see what makes it really unique." Originally built for Halo 3, given generously to Halo 3: ODST, and it was an instant hit. One question that's been burning at our core, however, is: Why is there no Matchmaking? This would make co-op nights, random bouts of Firefight, and team-filling much easier. Staten had an answer for us there, too. "Firefight uses the same networking that we used for campaign co-op in Halo 3 and that code didn’t support matchmaking. We could have added matchmaking support to Firefight for ODST, but that would have required a pretty huge amount of work by the same guys who were busy writing hot new networking code for Reach. Ultimately, we decided making the new hotness even hotter was the smarter (and sexier) thing to do." With Halo: Reach on the way, we can only hope to see things that made Halo-Halo 3:ODST great are improved upon even more for the next chapter in the Halo saga. That being said: More Firefight Mode, please? Page created in 0.2533 seconds.